Howdy toneful friends! Last week I had a really interesting guitar in the shop, it was a sweeeet orange Chet Adkins Country Gentleman... but not the Gretsch you might expect, this was a Gibson version! These are top-notch instruments in every way, and certainly rival the Gretsch models in quality. However, there is one very glaring difference: the pickups. The Gretsch comes equipped with real-deal Filter'Trons, while the Gibby has run of the mill humbuckers, which turn to mud in these guitars. Now if mud's your thing, great, but most folks will find the tone downright uninspiring, and that is PRECISELY why this guitar was brought to me; the owner had already switched the pickups to Jason Lollar's low-wind Imperials but she was still muddy! Let's talk about why. 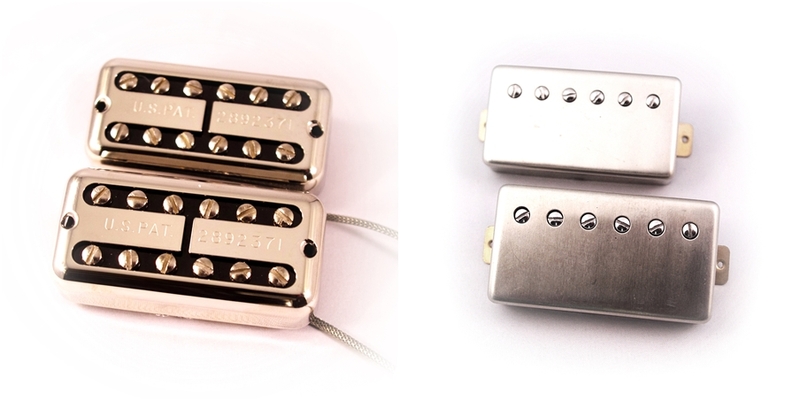 A Filtertron design (like my V-Trons) is ENTIRELY different than any other humbucker, and as such, nothing else sounds anything like it! Here's the real rub: lots of folks including even Gretsch themselves are making regular old humbuckers ... putting covers on them that kinda LOOK like filtertron covers ... and calling them Filtertrons! Shame! That brings us back to the low-wind imperials, even if the bobbins were wound to exact filtertron spec ... they still don't stand a gost of a chance at sounding like a Filtertron. Are ya curious as to why? Well, let's dissect the differences! Take a look at the filtertron bobbin compared to a standard bucker bobbin ... totally different geometry! Yep, that matters. Here's a BIG one, the filtertron baseplate has about three times the mass of a standard bucker baseplate, that means more INDUCTANCE! Plus, those claws you see coming up from the bottom hold the pole-screws firmly against the magnet for higher Gauss levels at the pole-pieces. But wait ... look at this, yep, the 'tron's magnet is TWICE the size of the bucker's! Yep, this means twice the surface area for the pole-pieces to contact with the magnet resulting in even higher Gauss at the pole-pieces! Speaking of pole-pieces, check out the 'trons big screws! Your eyes are no deceiving you, they ARE significantly larger than the standard PAF style screws, and way more massive than a PAF style slug. This translates into not only higher Gauss, but more induction, too! Do you have any recommended pickup heights for a Filtertron style pickup? Thanks! "Do you have any recommended pickup heights for a Filtertron style pickup?"